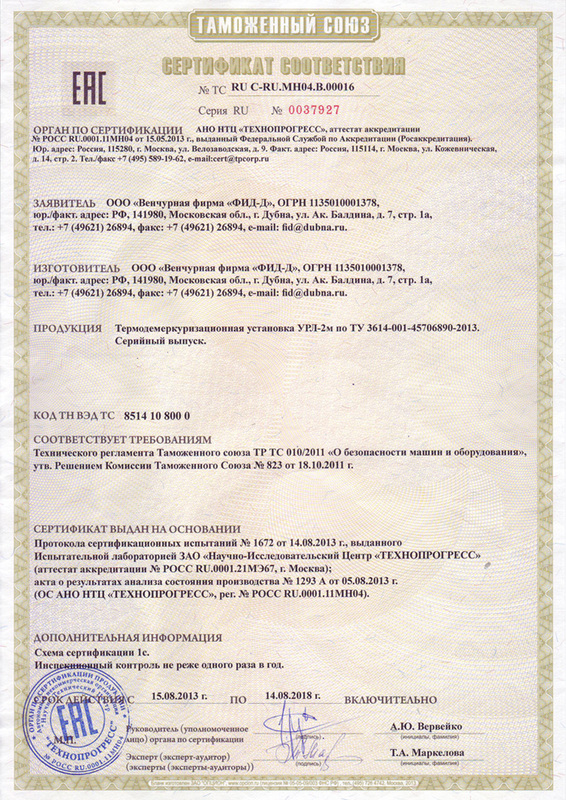 all necessary certificates and permits for use - a certificate for compliance with TR CU (Technical Regulation of Customs Union), the conclusion of the State Ecological Expertise. 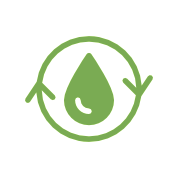 Unlike the situations when you use alternative technologies, in this case you won't have to worry about the disposal of luminophor or stupp as our equipment for recycling mercury-containing waste works on a different principle. The work is based on the revealed interdependence between temperature and pressure of mercury vapor. The demercurization (mercury removal) unit heats lamps to a certain temperature point so the mercury begins to evaporate and is pumped out by the vacuum system. Condensed product, collected in such a way on the surface of a low-temperature trap, then flows down into a special tank designed for the purpose. The demercurized cullet is then emptied by way of tilting the equipment's chamber. Mercury Metal that has been recovered with the help of URL-2m unit can be again used in production. The equipment for waste disposal URL-2m effectively removes mercury not only from fluorescent lamps, but also from used mercury-containing devices, contaminated building materials, scrap metal, soil, sorbents, metal amalgams. Also, URL-2m unit can be successfully used as an advanced retort furnace for extracting gold from amalgam. Equipment for the disposal of fluorescent lamps and other mercury-containing waste can be installed as a stationary unit in a room suitable for this purpose or on the chassis of a cargo transport vehicle (in a container or under a canopy). Dimensions of the stationary unit - 1900Х1280Х2100 cm, weight - 1200 kg. Demercurization temperature is up to 450° C.
The equipment for the disposal of mercury-containing lamps and other mercury-containing waste is supplied with a removable mill for grinding lamps, necessary spare parts tools and accessories, as well as a full package of documents for installation and instructions for use. Equipment must be cleaned weekly from dirt and dust. Preventive cleaning of the unit must be done on a regular basis (at least once in half a year). For this, the unit (without lamps) must be heated up to a temperature of 250 ° C and kept at this temperature for at least an hour, meanwhile the exterior metal parts located before the unit's NTD entrance must be also heated by hot air (blow dryer). You can receive Information about the operation mode, maintenance and other information about the installation of URL-2m unit from our specialists. You can ask questions by email, phone, in instant messengers or by filling the form of feedback. As for the means of electric shock protection of the man, the unit belongs to electric equipment of class I according to GOST 12.2.007.0-75. The unit's electrical equipment may serve as a source of possible damage to the operator by electric current. To prevent any possible damages caused by electric shock, the unit must be reliably grounded by connecting the grounding conductor (bus) to the grounding bolt located inside the electrical cabinet of the unit. The smallest dimensions of the ground conductor must be: 2.5 sq. mm. when using insulated copper conductors, 4 sq. mm. when using aluminum ones, 1.5 sq. mm. when using uninsulated copper conductors, 2.5 sq. mm. when using uninsulated aluminum ones. The resistance between the grounding bolt and the unit's body should not exceed 0.1 Ohm. The resistance of the insulated windings of the electric motors and the chamber heater must be no less than 0.5 Mohm. ATTENTION! The temperature rise of the chamber cover, its assemblies and the lower part of the housing of the high-vacuum pump in working condition over ambient temperature can reach 100 degrees C.
The noise level at a distance of 1 m from the unit does not exceed 60 dB. The unit must be serviced by staff of 2 people per shift: a shift manager and unit operator. In terms of safety, the following instructive documents must be used as guides: Interindustry labor safety rules in the field of production and use of mercury POT PM-009-99 (St. Petersburg 2001), "Rules of technical operation of electric installations of consumers" and "Safety rules for operation of electric installations of consumers", "Safety rules when working with liquefied gases", "Sanitary Rules for working with mercury, its compounds and devices with mercury filling", "Guidelines for control of the current and final demercurization", Local Safety Instructions approved by the company management. The unit can be operated only by staff having valid certificates of a safety qualification group no less than group III and trained according to the Rules for working with liquefied gases. The admission of the staff to work with the unit must be issued in the form of the order of the enterprise. The unit must be operated in a room having space no less than 20 sq. m, equipped with autonomous exhaust ventilation, 3x380V power supply, process water and a grounding contour. In case the process water is not available in the room, cooling of the unit's working elements (the pump and cutting blade seal assembly) can be done by an autonomous closed cooling circuit on the base of the circulating pump and the water tank (1-2 cubic meters). The recommended area of the process room is no less than 20 sq. m.
It is advisable to have a storage room for lamps with a capacity of up to 10,000 lamps somewhere close to the process room. The process room should be adjacent to the staff room equipped with lockers for workwear and a shower room. Workwear lockers must be connected with the exhaust ventilation system. Unloading of the demercurized cullet from the unit's chamber is performed by way of tilting the chamber so the cullet could pour out. Install the unit on a solid horizontal surface and clean it from dust. The unit's placement in the process room should provide a safe and convenient access to it and a good view of the control panel. The distance between the heat-radiating sources and the unit must be at least 2 m.
Remove the cover of the unit's power cabinet, check the insulation resistance of the phases of the power supply of the unit (no less than 0.5 MOhm) and then ground the unit. Connect the unit to the power supply system. The correctness of the phase sequence of the connected network is checked by turning on the forevacuum pump for a short time (1-3 seconds). The impeller of the pump engine should rotate in the direction of the arrow on the pump housing. Change positions of the two phases, if necessary. The working procedure of the unit is described in the "Operating instructions for the thermo-demercurization unit URL-2m" which is included in the set of operating documentation supplied with the unit. Maintenance of the unit's assembly parts: pumps, drives of the mechanism for lamp destruction and an electric vacuum gate is carried out in accordance with the recommendations given in the passports for the specified parts. Maintenance of the unit includes regular (once a week) cleaning of the unit from dust and dirt and regular (once a quarter) heating (in a working mode: under vacuum with a cooled trap) of an empty demercurization chamber up to a temperature of 300 degrees C with simultaneous heating with hot air (blow dryer) of the exhaust pipe of the chamber and the slide valve in order to clean the chamber and its vacuum lines from condensed mercury. Transportation conditions as for environment climatic impacts 5 (ОЖ4) , storage conditions 2 (C) according to GOST 15150-69. Packing option VU-0 GOST 19537-83. Transportation conditions as for mechanical impacts are average (C) according to GOST 23170-78. Storage of the unit without packaging is allowed according to GOST 15150-69. If the unit is transported in winter time, the cooling system must be completely freed from water before transportation. After transportation or storage at subzero temperatures, the unit's removal from storage must be done no earlier than 24 hours after its placement in a heated room. The unit contains rubber parts and working fluids in the pumps that's why its storage period before the start of operation must not exceed one year from the date of shipment of the unit by the Manufacturer. SPTA (spare parts tools and accessories). The manufacturer ensures the workability of the unit during the first year of its operation and during this period will replace free of charge the components and elements of the unit manufactured directly by the manufacturer. Warranties for accessory equipment are provided by the suppliers of the relevant equipment.